Eager fans wait for their scarves from ETA Thane Dunn. Photo Credit: Jeff Chase Photography. Three years later, the “fiercely private” Thane Dunn opened up during our phone conversation, and gave honest and entertaining answers to my questions, fulfilling his promise to give me “a doozy of an interview” to post on SIDEBURNS Magazine. Thank you, Thane. It was a pleasure chatting with you and preparing your interview for everyone to enjoy. Best regards, Carolyn. ETA Thane Dunn with Santa's helpers. Photo Credit: Jeff Chase Photography. A. I was an only child with an overactive imagination. I loved Spider-Man, and thought I might become him one day. I loved the Fonz from Happy Days so much, that when we went for a visit to Maine, I got a jacket and engineer boots just like the Fonz. I first saw Elvis Presley when I was around six years old. The movie Spinout was the first movie shown during Eddie Driscoll’s Great Money Movie ‘Elvis’ week, a program that was broadcast in New Brunswick from Bangor, Maine. I was very young, but I remember thinking that he had a ‘spark’, and could sing, and got the girls. I felt Elvis was part of my family because his records were always played at my house. My ‘girlfriend’ when I was six had the record “Return to Sender” that we played over and over as we danced on her bed. Her mother, who was amazing, had a tickle trunk like Mr. Dressup that had a slick black wig that I used to like to wear. ETA Thane Dunn. Photo Credit: Jeff Chase Photography. A. My life as a teenager was interesting. When I was thirteen, I entered the school talent contest. I used Vaseline to make a pompadour hairdo, borrowed a jacket from my dad’s closet, and with my friend on guitar, performed "Heartbreak Hotel". Our act was well received, but we were beat out by the French class girls who did a clog dance with wooden shoes. I looked like Elvis, so the kids at school started calling me Elvis. Around grade 6, I tried out for the school choir and was told I couldn’t carry a tune in a bucket. Not one to be discouraged, I went ahead and kept on singing. After my voice changed, and I performed with bands, people would tell me I sounded like Elvis. At school, I loved history, but had a love/hate relationship with biology because I hated the subject but had a great teacher. In high school I spent a lot of time chasing girls and raising hell. It was a lot of fun. A. My dad sold restaurant equipment on the road, so I got involved in sales. I sold cemetery properties for Arbor Memorial, and won a ton of awards for my salesmanship. A. Not really…not until I got into the ETA business. I have probably have spent $5000 for voice lessons over the years, and not all the money was well spent. A. 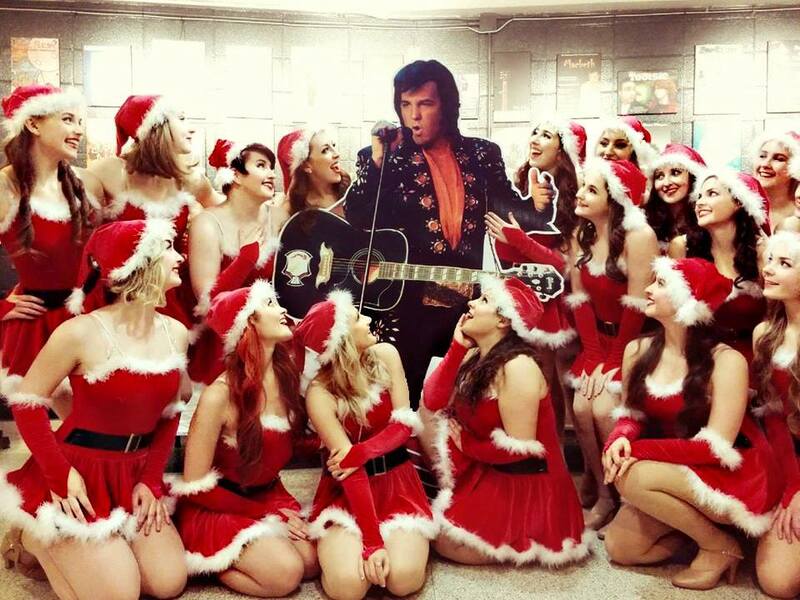 We listened to traditional country, like George Jones, Patsy Cline, and Tammy Wynette, and Elvis Christmas albums. ETA Thane Dunn's jumpsuits. Photo Credit: Jeff Chase Photography. 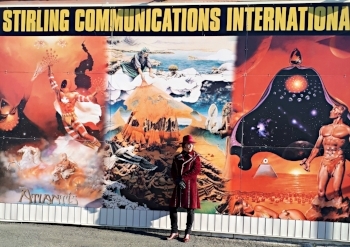 A. I was in Las Vegas, and even with my blondish brown hair, people would ask me where my show was in Vegas, thinking I was an ETA. I was pursing my sales career at the time, and Elvis was not a part of my life. But I would see and hear him everywhere—in a movie as I flipped through TV channels or even in cartoons, so I decided I would see where I could go with putting on a show. I drove from Moncton, New Brunswick, to Calgary, Alberta, in my 1960 Cadillac. Gas for the trip ate up all my money and I arrived in Calgary with $90 in my pocket. A guy, who saw my car parked on the street, knocked on the door of the place I was staying and asked if I would sell him my car. I sold my Cadillac for 5xs what I originally paid for it. I was asked if I could sing Elvis songs, and a friend of a friend in Calgary sold me a jumpsuit, starting me on the ETA road. ETA Thane Dunn, September 2012. Photo Credit: Jeff Chase Photography. A. One of the early things I did as an ETA was actually awkward because a professional (a doctor or dentist) asked me to come to his office and sing “Love Me Tender” to a lady in his office and present her with a scarf. I also did a karaoke track at a bar located in the countryside of New Brunswick. Women loved it; men hated it. I ended up in the parking lot a couple of times that night, but I kept on going back in to sing, lol. Q. Describe the atmosphere before a competition backstage. A. I hate competitions with a passion. I get nervous, and people get on my nerves. Confrontations happen before a competition, and I have seen ETAs making fun of other ETAs. Q. Describe the process of turning yourself into a stage ready ETA. A. When I am getting ready before a show, I always brush my teeth and see that I am clean shaven. I use dry shampoo to replicate Elvis’s teased hair. My circa is 1972 and I try to look as good as I can. I don’t wear makeup, mascara, or eyeliner. I always have good tan, so the bright lights do not fade my complexion in photos. I always say a prayer, and thank my angel, my dad, Charlie Dunn. A. After I drove 17 hours from New Brunswick to Ontario, and through the hectic traffic of Quebec, I arrived at Collingwood white-knuckled and rattled. Still, I thought I could win. I sang a song that I couldn’t sing, “Just Pretend”, which was out of my grasp at that point in my career; so the outcome was not what I had hoped for. I honestly thought I would never compete again. Q. What valuable life lessons did you learn from your parent(s), or mentor, that you still use today? ETA Thane Dunn in performance. Photo Credit: Jeff Chase Photography. A. From my dad, I learned my people skills. He was the greatest salesperson. He was very personable, and people trusted him. I learned right from wrong from my dad. I learned how to treat people and to expect to be treated the same in return. The lessons I learned from my dad, I still use today. I am so much like my dad…even my handwriting is like his. My father and I always loved Johnny Cash gospel music, and when we went on trips together we would sing his music in the car. In 2012, I sang gospel at Collingwood—a year after I lost my dad, and that particular win meant more to me than the overall win in 2009. A. The biggest highlights of my career have been working with the Bill Baize, who sang with Elvis and is the high tenor on “Burning Love”, and J.D. Summer and the Stamps. When we were doing “Aloha from Hawaii”, Bill joined me in my hometown of Moncton, New Brunswick. 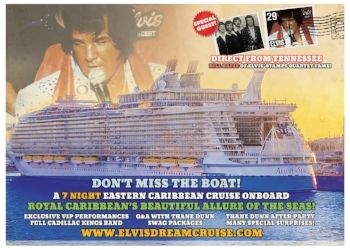 Bill paid me the compliment of saying, “Thane Dunn is the closest I have seen to Elvis.” And on a Royal Caribbean Allure of the Sea Cruise, during the third show in the Amber Theatre, Bill, who is my vocal coach, said that I hit notes that he hit in 1972. Bill Baize is the topping on my musical cake. A. I like meeting new people, so the best part of being an ETA is all the interesting people I meet. I have raised 50 to 60 grand for charities since 2009. I was made Celebrity Ambassador for the SPCA, which suits me well because of my love for animals. A. My wife, Melanie Dunn, is important to me because she is my rock. She is also the greatest singer I have heard in my life, and I have learned more from Melly about singing than I did from the teachers I paid. When Melly was diagnosed with ovarian cancer, we thought there would be no children to carry on my dad’s name because I am an only child. It was a miracle when our son was born. Charlie, who is named after my dad and who is almost three years old, has brought so such joy to our lives. "If they think I am Elvis, that is okay." ETA Thane Dunn. Photo Credit: Jeff Chase Photography. A. On stage, I never refer to myself as Elvis, but I also don’t say, “Elvis sang this song.” I have a different spin: I want people to get carried away, and if they think I am Elvis, that is okay. 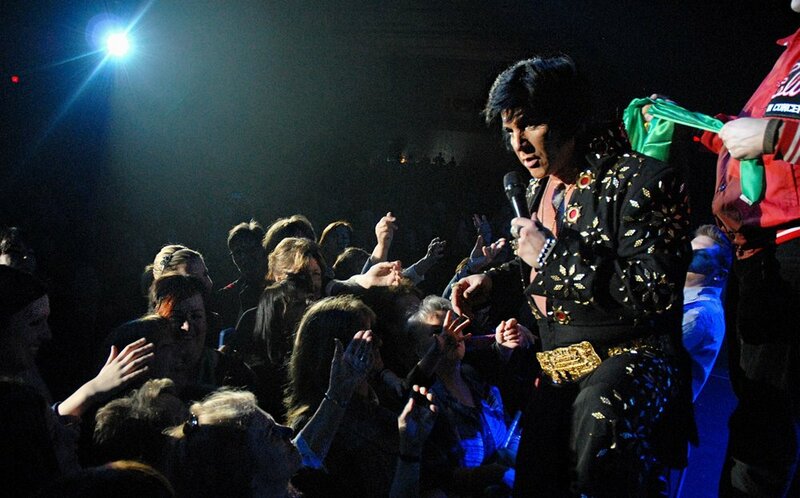 People who have not yet been to my show, but know Elvis, will find him in my performance. Off stage, I am Thane Dunn. I like who I am. A. I honestly would like to win the Ultimate. A. No. I think getting the other judges on the same wavelength is difficult. There is a certain criterion in performance that is needed to be convincing. Over the years, the image has been watered down by TV and the media, and even by some Elvis impersonators. There is a handful of ETAs who are convincing. Many have nothing in common with Elvis, other than the jumpsuit, and judges really need to know their stuff. Other judges, such as the mayor of the town, are not really qualified. A. One of my managers, a gentleman from Manchester, UK, has had a positive influence on my life. He has taught me business skills: how to market a show, how to deal with theatres and rentals, and how to back the shows—everything I need to know to market my product. A. Nothing makes me sad. I exercise, eat right, take care of myself and have the love of a good woman. A. England. My wife is from England. A. 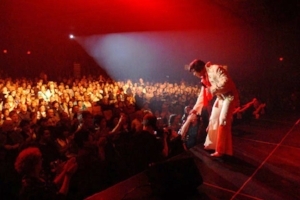 A little bit of everything: a voice that sounds like Elvis, the look and resemblance to Elvis, and a sense of humour…everything to get the audience in the palm of my hand. A. I don’t get much time to relax because I run my own shows. Pensacola State Fair came up, and I am dealing with different booking agents. I try to make time every day for my family. I make events happen, and it is a job and a half! A. My wife makes me laugh. My son makes me laugh. The other day, he greeted me with, “Hello, darling. It’s nice to see you.” He is extremely intelligent, and started talking early. Life makes me laugh. I laugh with people, not at them. I laugh at myself. Melly Dunn, Thane's wife, sings the part of Kathy Westmoreland in Thane's shows. 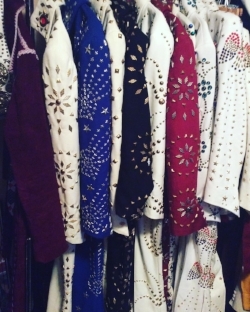 A. I would ask Elvis why he kept so many hangers-on for so long. I would tell him that I love him as if he were part of my family. I would thank him for allowing me to do what I do on stage that helps me pay my bills. A. I treasure my family, my wife, and especially my son. I treasure the people who follow me, and my loyal fans. Q. If you weren’t an ETA, what career would you choose? A. I would be in sales; it is in my blood. A. The impact you make on people’s lives if you do your tribute correctly. A. Last year we were doing a show in a place where we had not been before, and a lady who responded to “Love Me Tender” more than others, told me she had been at Elvis's concert in Buffalo in 1972. The same lady and her husband were on the Dream Cruise, where another lady, who was from Newfoundland, won the picture that John Rowlands had taken of Elvis in Buffalo in 1972. Both had a connection to the 1972 concert, and both were on the cruise at the same time. I thought it was an interesting coincidence. A lucky lady waits to receive a scarf from ETA Thane Dunn. Photo Credit: Jeff Chase Photography. A. We do it like Elvis did, otherwise it turns into pandemonium. I try to be fair. Q. What sacrifices have you made for your ETA career? A. For one thing, when I retire I won’t have a pension--other than what I put into it. I rolled the dice, and everything has turned out okay so far; but I am not Elvis, so there is a risk about shows. A. My favourite suit was made by Mark Woodward, who is, in my opinion, the best in the business. He made me a copy of the white pinwheel jumpsuit that Elvis wore for the 1972 tour that was documented in the MGM documentary. I purchased a stud that was from the jumpsuit that Elvis wore at the April 6th, 1972 concert, from Joseph Kereta, one of the world’s top collectors, and Mark added to my costume. Q. How do you care for your costumes so they are always stage ready? A. I have 12 or 13 jumpsuits that I hand wash.
ETA Thane Dunn's many jumpsuits. Photo Credit: Jeff Chase Photography. A. I am in a business where anyone can jump into and you don’t have to have any talent whatsoever. There are great people who do this, but they are few and far between. Unfortunately people paint everyone with the same brush. Some people see a show and get turned off by the experience and don’t go to see a quality show. A. Nothing. I have strong faith that keeps that me going. I have strong faith in the Lord. A. I would like to have my own show in Hawaii. I would live there for a few months a year on a consistent basis. ETA Thane Dunn in his Comet suit. Photo Credit: Jeff Chase Photography. A. I try to learn from my mistakes. A. I see a lot of guys wearing gold lame jackets who look like they come from an old folks home. I try to take care of my body, but I am realist, and if I see an old man in the mirror, and I don’t look like a vibrant Elvis, I will know it is time. I have to be able to create the magic. A tribute means something positive to me. A. I may get into the real estate business, or into politics. ETA Thane Dunn's car. Photo Credit: Jeff Chase Photography. A. I would like to thank my wife of 8 years, Melanie, the people who come to my shows, and my fantastic band, the Cadillac Kings from New Brunswick. A. I am a Libra. I am left handed. I have a car that was owned by Sammy the Bull Gravano, henchman for Mafia boss, John “Dapper Don” Gotti. A. Keep up the good work everyone. A. “Pure love” by Ronny Millsap. Q. What question do you wish I had asked, but didn’t? A. Tell me about your April 28th show in Toronto. Q. How would you answer your own question? A. I would include a poster showing the details of my upcoming show.